Got a chronic case of the Mondays? Amanda Day has just the remedy. The Toronto comic and producer behind the cult hit weekly standup show #StonedUpComedy (Thursdays in Toronto’s Kensington market), Day is also the host of the Date Fail podcast. Airing weekly on the Talkhole Comedy Podcast Network. This past year she was busy making the festival rounds, onstage here in Toronto at the She Dot Festival and heading down to L.A for the Laugh Riot Grrrl Festival. This Monday, Nov 21 the ever-busy comedian has pot (sorry, put) together a lineup featuring 5 of the city’s favourite standups, upcoming comics, and veteran storytellers for a rare and random showcase at Toronto’s famous Comedy Bar. Monday Night Mirth aims to get a local crowd in from the cold and out of the Monday blahs for a night of comedy at one of Toronto’s top venues. And with everything going on in the world right now, while our redneck neighbours rapidly plummet our property value, chances are we could all use a chuckle. Luckily, putting together a well-assorted lineup of carefully cultivated comedy is kinda Amanda Day’s thang. 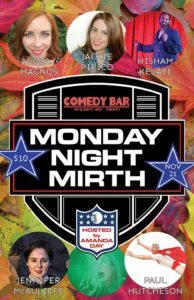 Monday Night Mirth (yours for the Low Low price of $5 online at www.comedybar.ca or $10 door) features Comedy Bar mainstay and Laugh Sabbath member Jackie Pirico. Master storyteller Paul Hutcheson. The razor-witted Queen of Twitter Jennifer McAuliffe. With comics on the rise Luba Magnus and Hisham Kilati rounding out what we don’t mind saying is a pretty packed l’il lineup all on a Monday night in Movember.